O2's 4G network goes live today! 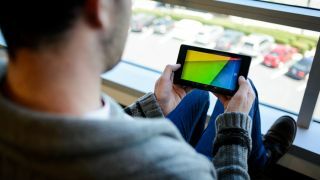 O2 has announced a major 4G exclusive, by getting first dibs on the LTE-enabled version of the 2013 Google Nexus 7 tablet, to coincide with the roll-out of its next-gen network. The bubbly company's 4G LTE network goes live in three UK cities on Thursday, with the speedier Nexus 7 also going up for pre-order, allowing buyers to secure delivery for the September 13 release date. The 4G LTE Nexus 7 will cost £319, with buyers also able to sign up for 4G data contracts on the network, the terms of which are likely to be confirmed later today. The £320 price point is significantly higher than the Wi-Fi-only version of the device which starts at £199 for the 16GB version and rises to £239 for the 32GB counterpart. Although O2 appears to have the UK network exclusive, reports later on Wednesday seemed to confirm that the 4G-enabled version of the device will also be available from the Google Play store. That lessens O2's bragging rights somewhat, as punters will still be able to pick up the device SIM-free and pair it with other 4G LTE networks. Google has not confirmed its official pricing, nor which networks the device will be compatible with. We should learn more on Thursday. Not ready for 4G? No worries. The Wi-Fi only Nexus 7 is now available in the UK!